Barnaby Hone continues his series of POCA, asset forfeiture and asset recovery articles with a commentary piece explaining the new powers prosecution authorities can utilise to extend the moratorium period on Suspected Activity Reports (SARs). 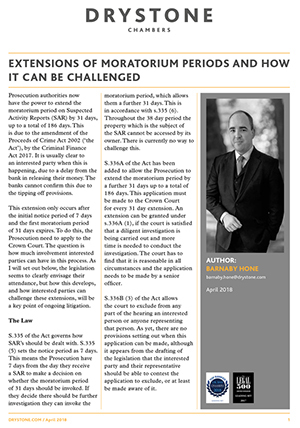 Following amendments made to the Proceeds of Crime Act 2002 by the Criminal Finance Act 2017, prosecutors can extend the moratorium period up to a total of 186 days. Barnaby outlines the law and anticipated points of issue, whilst explaining what the prosecution need to do to persuade the court that there are ‘reasonable grounds’ to extend the moratorium period.